You know what we haven’t had a lot of around here, lately? Cocktails! And while I had something else in mind for today’s post, I was happily reminded that today is Mixology Monday and I have the perfect cocktail inspiration. So today we’re joining up with other mixologists around the web and our host for this round, Rated R Cocktails, to bring you my version of the Black Julep cocktail. At Northside Pies a couple weeks ago I ordered a Black Julep from their cocktail menu and was pleasantly surprised at how good it was. I’m not usually a big bourbon fan, though I’ve acquired a taste for the smoother ones over the years. One of my favorites is Tennessee Honey by Jack Daniels–I don’t generally sip spirits neat, but this one I will. The other component of a Black Julep is blackberry something–that’s where my memory got a little fuzzy (but I swear I only had one!). For my version of the Black Julep I decided to make a syrup from blackberry wine in addition to muddling some blackberries in the bottom of the glass, like you’d do with mint in a normal julep. A semi-local winery in Defuniak Springs, Florida, Chautauqua Winery, makes a fabulous blackberry wine that we’ve been known to plan a weekend road trip around just to restock. It’s that good. If you don’t have a local favorite, Arbor Mist’s Blackberry Merlot would probably do in a pinch. TheÂ blackberry syrup isÂ 2 parts wine andÂ 1 part sugar, boiledÂ until the mixture coats the back of a spoon. Now, when I say coats the back of a spoon, I mean you can run the back of your fingernail through it (or the tip of a knife, if you have short nails and don’t want to burn yourself) and the furrow doesn’t immediately fill. Let cool a bit, just so it won’t immediately melt the glass of ice. You can, of course, make this ahead of time and store it. 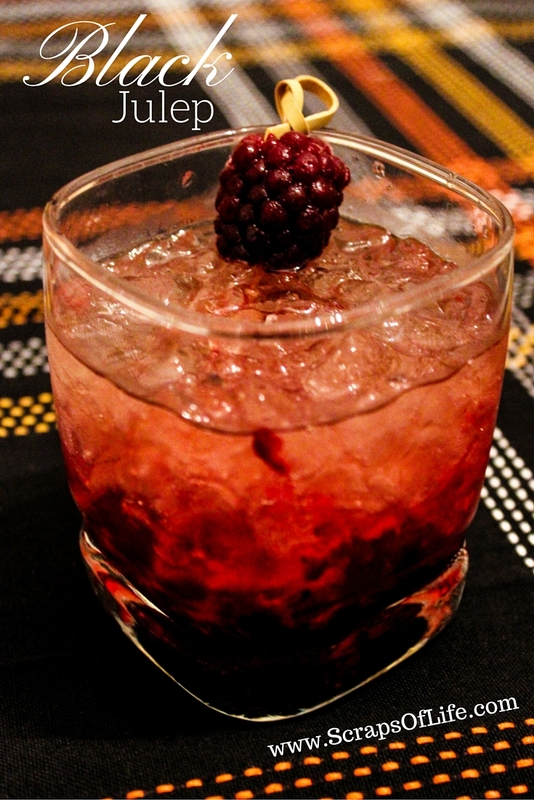 Muddle 2-3 blackberries in the bottom of a rocks or low-ball glass with a dash of sugar. Fill the glass with ice and pour in the Tennessee Honey. Top with club soda until almost full and swirl the glass to combine things a bit. Pour some of the blackberry syrup over the back of a spoon into the drink. Garnish with another blackberry on a cocktail pick and enjoy. While I think the color of the drink is a little on the macabre side, the theme of this month’s MxMo is Spooky Sips. Frankly, the scariestÂ thing about this cocktail is how sweet it is. That was my intention, of course. If you’d like more spooky cocktail inspiration, head over to the host’s blog and check out the comments for more of this month’s participants. Hmmm a black julep. I’ll have to give it a try sometime! Now I just need to figure out where I can get some blackberry wine around here. That sounds absolutely delicious! Whiskey is a surprisingly good mixer when it comes to dark fruits! Right, Jaclyn, it’s all about balance. It makes sense that darker, richer, earthier fruits would pair well with darker, stronger spirits. This sounds soo good! I love blackberries so I think I would really enjoy this cocktail! We have a holiday here soon (school vacation time) called blackberry week. This would be perfect! How lovely! If you get a chance to try it out during blackberry week, let me know how it turns out! Love the color! I definitely would like to check out all of this month’s participants. You guys are so creative!! Thank you, Eva, and please do! The cocktail blogs have been dropping off in recent years, but the ones that hang on are definitely worth watching. What a fun idea! I love the colors of this drink & it sounds like it tastes amazing 🙂 I’ll have to give it a try sometime! I hope you like it when you try it, Jordan! This looks positively delicious can’t wait to try it out! It really is delicious, Ana! I hope you get to try it sometime! What a unique concept. Would never have thought of the blackberries. Looks delicious though. I’ll have to try it sometime! It was a pretty novel idea when I spotted it on that menu! Happily the two go really well together. I dont drink mixed drinks but if I did, this sounds delicious! Love the looks of this drink! I am not a whisky drinker but my best friend is – I will for sure hare this with her. I’m not usually either, Stacey, and yet, cocktails like this are worthy exceptions! For a non-alcoholic version I’d suggest a tart ginger beer for the whiskey and then you could use any available blackberry syrup for the wine reduction. I wouldn’t use cola, though, I think it’d be too sweet. looks so good. i love seeing all these spooky cocktails. im down for any of them. lol. This would be great for a Halloween cocktail party. It sounds delicious! I suppose we’ll see this weekend–gotta make some more of the syrup so we can mix some up for friends! I love a good cocktail & this one sounds like one I might enjoy! Glad to hear it, Laura! This looks like a drink my husband and I will enjoy. I can’t wait to try this. I hope you both enjoy it! I hope you enjoy it, Susannah! This looks delicious and perfect for Halloween! Thank you, Kelly, that was my thought, too! Oooo this drink sounds delicious!!! I must give it a try! Yum! I hope you enjoy it, CourtneyLynne! Amazing! Its so festive and fun, I’m definitely going to be adding this to the holiday drink rotation! This drink looks yummy! Pinning to my “Drinks” board on pinterest. 🙂 Thanks for sharing! It’s definitely not something I’d typically have. BUT, it does sound delicious! !